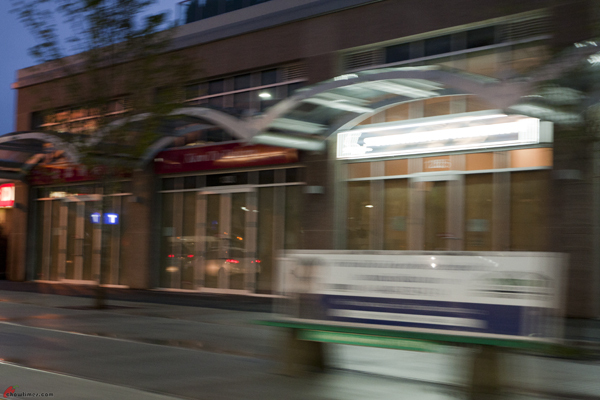 Guess Who Is Opening Across the Street from the Richmond Brighouse Station! We were out for dinner tonight. As I was driving along No 3 Road and nearing the Richmond-Brighouse Skytrain station, Suanne suddenly told me that “They are finally opening. The sign is up today”. “Huh? Who? What? Where?” I asked, knowing how random she sometimes gets. She then went on to tell me about the time she heard the waitress of our favourite restaurant talking about opening a new restaurant in the prime location across the terminus station. “Take out the camera. Quick.”, I told Suanne. She whipped the camera out with double quick time … you know, like cowboys whipping out their pistols from the holsters in a gun duel. … and she had to take the picture above. Sigh. Let’s take a closer look at one of the lesser provinces in China. I am talking about the province of Yunnan. Here. See the map. Yunnan is the southern most province and it borders the South East Asian countries of Burma, Vietnam and Laos. If you are familiar with geography in the area, it is green and forested … more forested than anywhere else in China. And yet it is a poverty stricken province. One third of the population are made up of several ethnic minorities which has a lot of cultural similarities to the South East Asian countries. 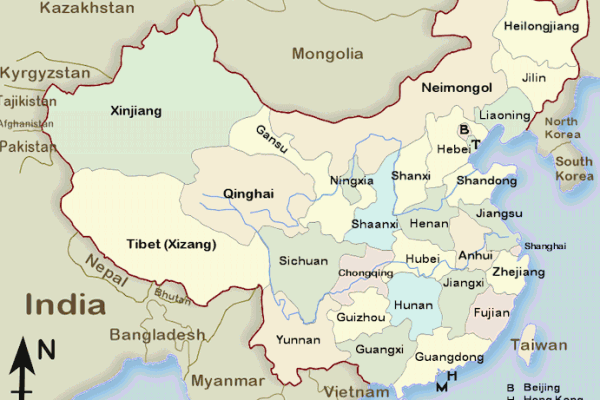 As a matter of fact, Yunnan has more ethnic groups in the whole of China. Because of its natural beauty, this province thrives on tourism. Most of the tourism are internal. The world is still too focused on the Shanghai, Beijing and Xian. If there is one dish that is unique to the province of Yunnan, it is the “Crossing Bridge” Rice Noodle (过桥米线). You can get it throughout the province. I went to a stall just last week and came across the board above. Did you notice the headgear of the figures above. That is not Han Chinese but is of one of the ethnic minority groups. Cross Bridge Rice Noodle is a special dish of Yunnan. It is originated during the Qianlong period, nearly 200 years ago. There is a popular legend regarding its origins. It is said that a scholar in Mengzi, who was preparing for the Imperial examination, went to an island in the Na Lake everyday to study. His wife went across the bride to the island to bring his meal to him. Owing to the long distance, he had to eat the meal cold everyday. Accidentally, his wife discovered that a greasy chicken soup is not easy to get cold. What’s more, fresh ingredients, such as seasonal vegetable, fresh meat and so on, can become edible by putting them into this kind of boiled soup. From then on, the scholar could have a delicious and hot meal everyday. Because his wife went across the bridge everyday, the rice noodle made this way was named as Cross Bridge Rice Noodle. 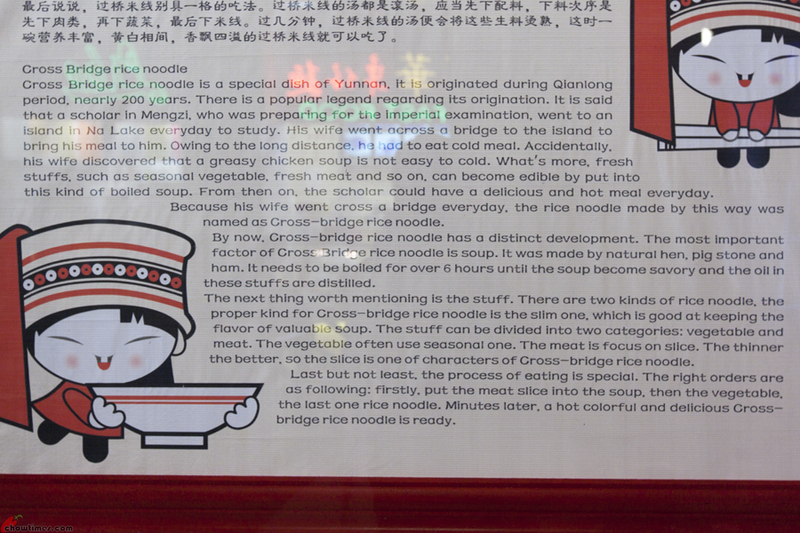 By now, the Cross Bridge Rice Noodle has a distinct development. The most important factor in this noodle is the soup. It was made with natural hen, pig bone and ham. It needs to be boiled for over 6 hours until the soup become savory and the oil from these are distilled. The next thing worth mentioning is the ingredients. There are two kinds of rice noodles. The proper kind is the slim one, which is good at keeping the flavour of the valuable soup. 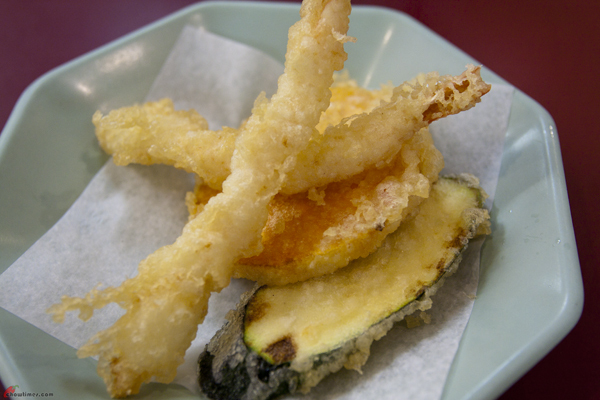 The ingredients can be divided into two categories: vegetable and meat. 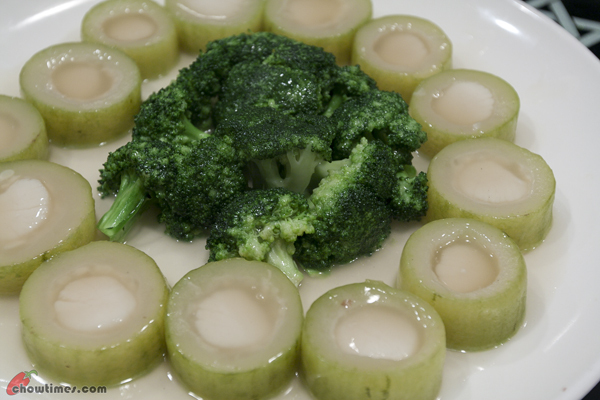 The vegetable used are dependent on what is in season. 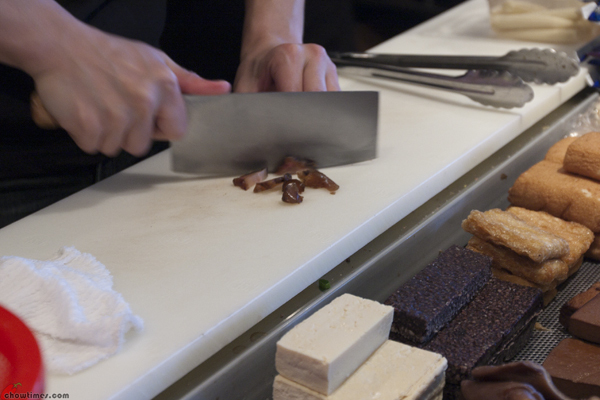 The meat is focus on slice. 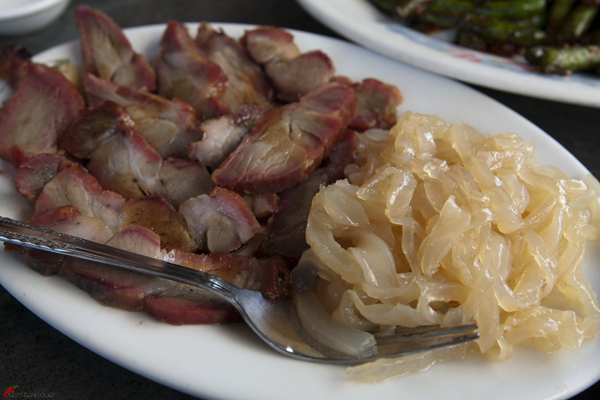 The thinner the better, so the slice meat is one of the characteristics of the Cross Bridge Noodle. Last but not least, the process of eating is special. 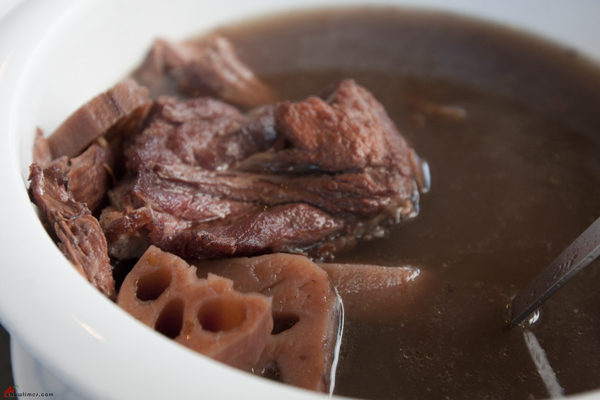 The right orders are as follows: firstly, put the meat slice in the soup, then the vegetable, the last one rice noodle. Minutes later, a hot colorful and delicious Cross-Bridge Rice Noodle is ready. It is not a fancy place where I got the Crossing Bridge Rice Noodle. I came across this in the food court in Crystal Mall in Burnaby. This stall is new. I think this stall used to serve Korean food. Anyway, you won’t miss it because it is located right on top of the escalator. I was more drawn to this place because of the story behind the dish. 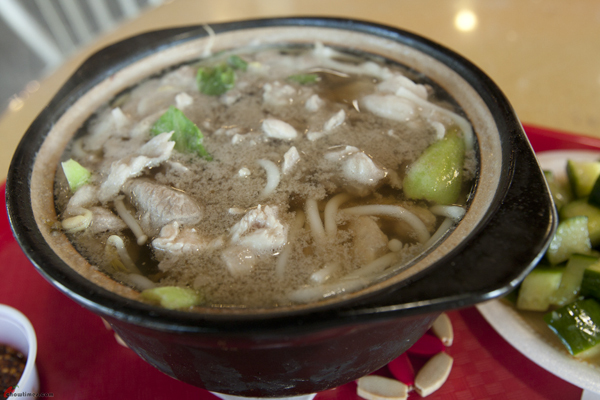 While their specialty is the Crossing Bridge Rice Noodle, they have other dishes too. I thought that the Cucumber with Spicy Sauce was particularly cheap at $1.75 and so I got one to try. I like this and often order this in Sichuan restaurants. 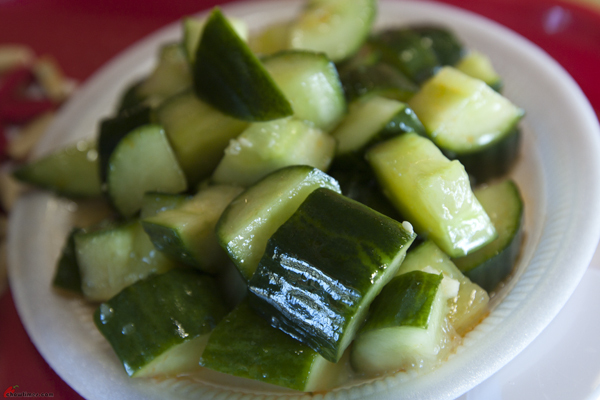 The cucumber is fresh … crunchy and cold. It doesn’t look spicy isn’t it? There are no tell tale chili flakes. The sauce wasn’t even red. But it is spicy alright. Real nice spicy. I was kind of disappointed when they served the Crossing Bridge Rice Noodle. 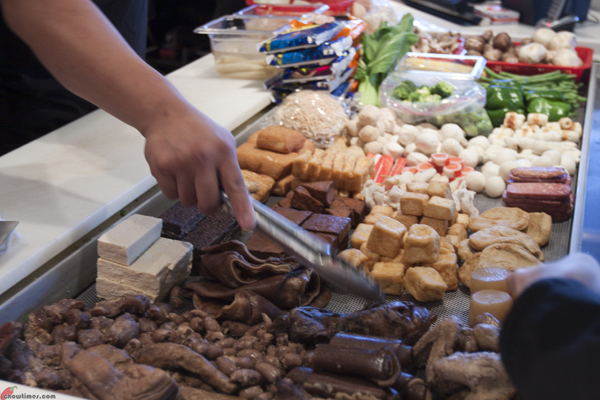 They dump everything into the hot pot. No fun! That’s right. Every time someone mentions the word street food, people sit up. Street food has to be the hottest conversation on food these days … especially with the street food pilot program that the city of Vancouver launched a few weeks ago. It did not get off to a great start as everyone know. Anyway, many people seems to have their own opinions about what street food is and what their expectations are. To some, street food is just about anything that is sold on the street. I hope I did not read it wrong but I think I read somewhere that there is one food cart selling ice cream on croissants. That bizarre idea aside, the prices charged for street food is so expensive that it costs the same as if you are eating in a restaurant. 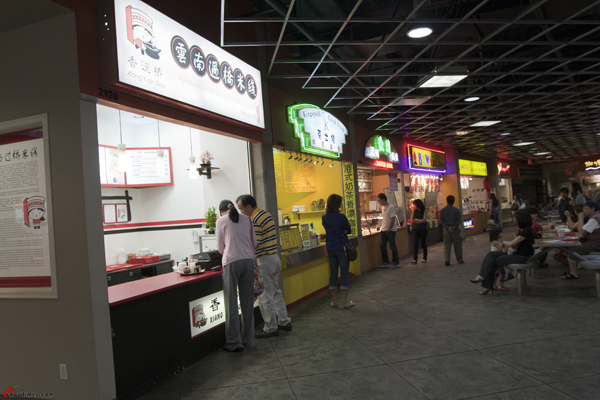 My expectation … is that the whole premise of street food is that it has to be cheap. That is the model of street food in Asia. In our city, it is anything but cheap. I don’t know what you call this. Tri-Pot call this the Low-Carb Snack On The Go. So I am making a wild guess here — is this called Tianbula – (甜不辣)? The way you order this is simple. There are over 50 types of ingredients. Each of them costs $2 (items 1 through 43) and the remaining ones are $3. Looking at the prices, I reckon people will normally order 3-4 items which will work out to be $6-$10. Not particularly cheap. I am sure it is way cheaper getting this from the streets in Taiwan. The receipt on the left is mine. Actually mine also included Egg Noodle but it landed on Suanne’s receipt. It took them a while to prepare this. It wasn’t very long but considering that they had to cut every piece up into small pieces and then cook it, it is perhaps a 5 minute wait. Remember now that this is meant to be a take-away meal. 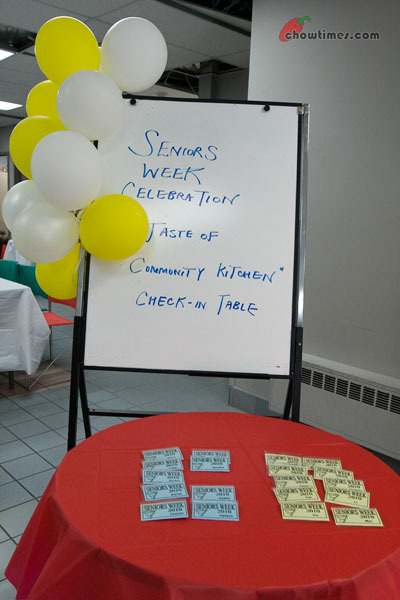 The South Arm Community Center hosted A Taste of Community Kitchen as one of the event for Seniors Week Celebration in June. 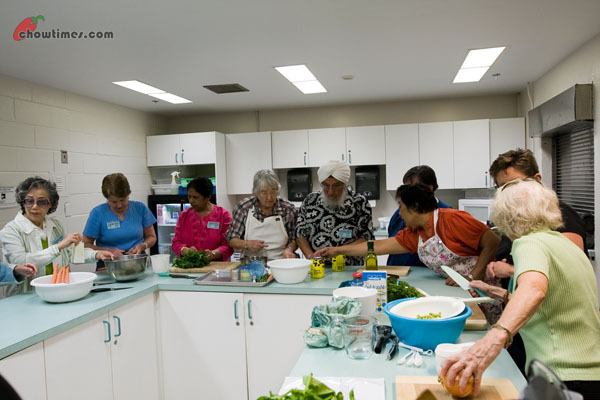 South Arm Community Center is one of the pioneer to have a community kitchen program for seniors. 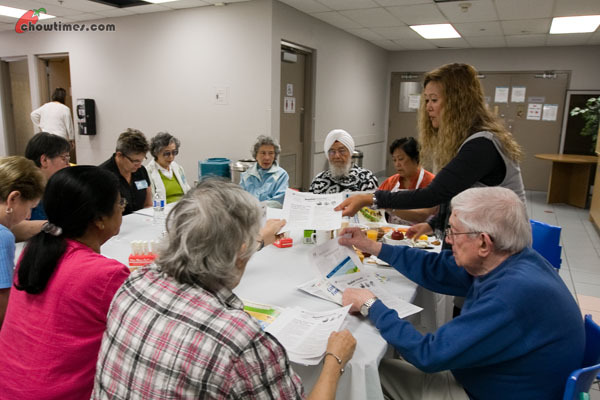 This event was opened to all seniors of the community centers in Richmond. There were more than 20 participants who attended this event. 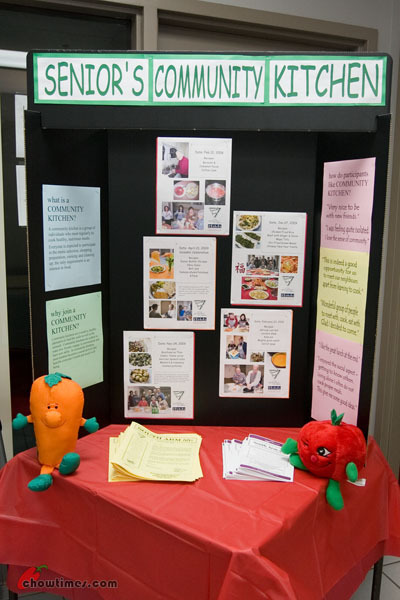 The above was a station which showcased the activities in the South Arm Cooking Club for seniors which included a coverage by Shaw TV on the program called “‘The Express”. The program for the day included a talk by a dietitian and A Taste of Community Kitchen. The group is divided into two and both activities ran concurrently and the groups switched half way through the program. Sharon J. Tateishi (standing) was the dietitian who shared with the group. While a group was attending the nutrition talk, the other group worked in the kitchen. 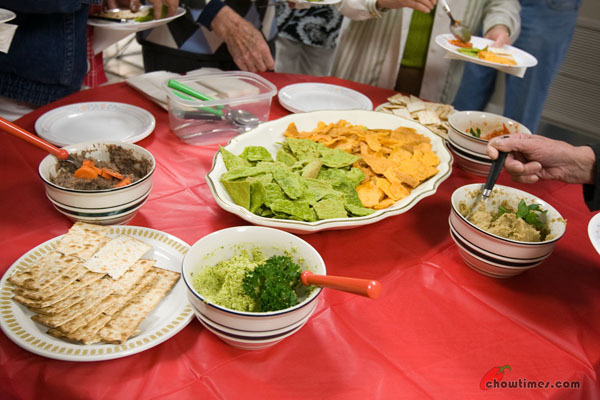 The group was subdivided into smaller groups to work on different recipes. Maria brought crabapples to make Homemade Apple Pectin in the Food Preservation Workshop. The crabapples were harvested from her neighbour’s backyard. Crabapple is also known as wild apple. They are rarely eaten raw as they are extremely sour and woody in some species. 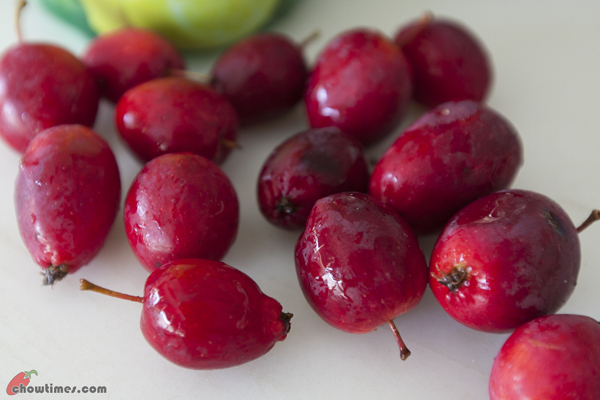 Crabapples are an excellent source of pectin. 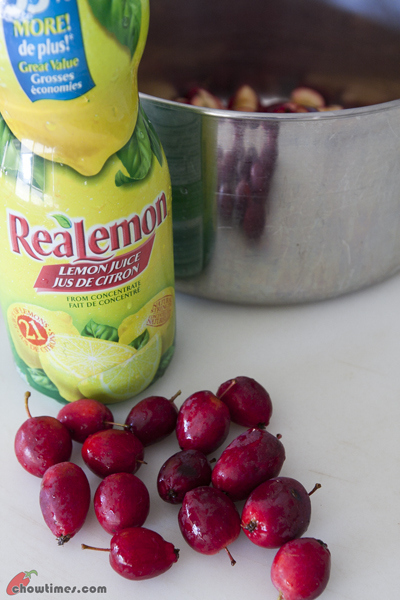 If you do not have crabapple, you can still make pectin with tart apple skin and core, just that you must collect enough of them when you make lots of apple sauce in the fall. 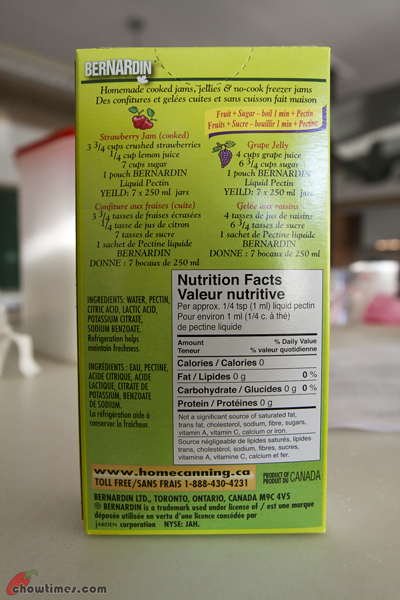 It is best to make pectin from apple in the fall when they are freshest as the pectin content decreases over time. 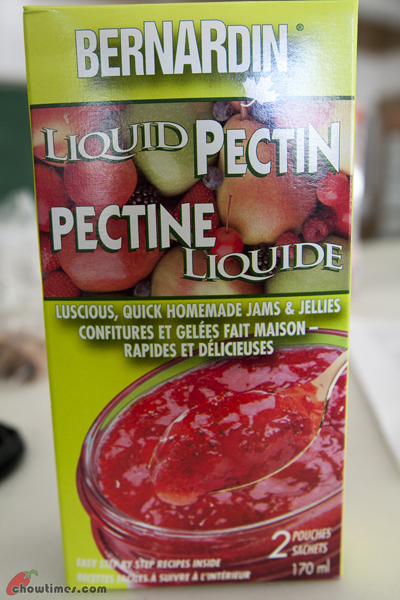 One cup of apple pectin is good to make preserves for 3 pounds of fruit of low pectin like pear or cantaloupe. The Richmond Sharing Farm had some golden plums for the food preservation workshop. 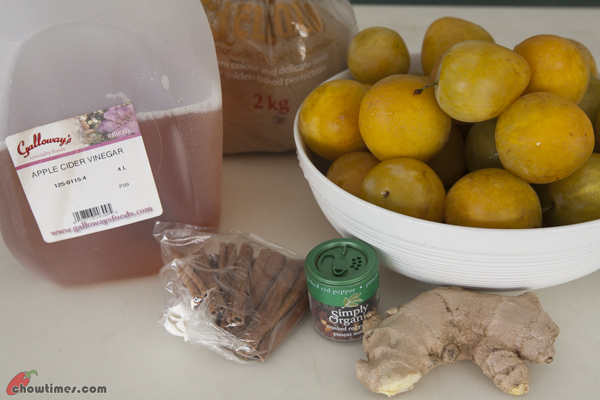 The plums were donated by people who has plum trees in their backyard. For those of you who like to donate your fruits to the sharing farm, give them a call and volunteers from the farm will be arranged to pick the fruits. You do not have to pick them yourself. The Richmond Sharing Farm contacts can be found here: http://www.richmondfruittree.com/contact_us.html. Initially, Karen wanted to make pickled plums. However, when she saw the ripeness of the plum which is not suitable for pickled plums which require firmer plum, Karen switched to make Spiced Golden Plum Jam. Hence, the photo of the ingredients is not so accurate. Maria brought up a concern on the liquid pectin which has sodium benzoate which when combine with vitamin C (ascorbic acid) which naturally exists in fruits, will form benzene, a known carcinogen. However, Karen said the amount that is consumed via such preserved food is considered below the dangerous level. If you are concern, try to use those powder form or make your own pectin which I will cover next. This is how I would sum this place up. It is not that it is totally unjustifiably expensive. It is just that we did not expect a small restaurant like this would serve high end Cantonese food. I mean … just look at the size of the restaurants. From the outside you would even think that this is a hole-in-the-wall. Moreover, it is not located in the section of town where there are high-end restaurants. 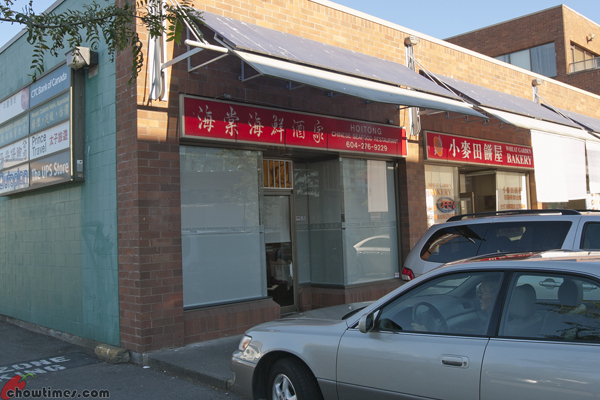 Located in the strip mall just across the street from the Richmond Public Market, the Hoitong Chinese Seafood Restaurant had apparently been operating here for the past two years. It is located at the far corner of the mall and rather inconspicuous. We had walked past this restaurant many times before and each time we peek into it, we noticed that it a bit posher than one would expect. I suppose the dead giveaway should have been the word “Seafood” to their name. It is a really small restaurant. They only have 2 big family sized tables and 5 medium sized one. The chairs are comfortable. Why, they even have a chandelier on the ceiling, although a small one. The word “seafood” on their name and the setting should have given us the clue that it could be expensive eating here. For a place this size, it is manned by a captain and a waitress — both looked very professional just like the senior managers in more established restaurants. They are even in suit and tie. It was kind of unreal actually. Everything is like what you would expect in big posh restaurants like Jade Garden or Shiang Garden except that this is a hole-in-the-wall sized ones. You don’t normally see such Cantonese seafood restaurants this small. They are mostly big operations. So unreal. 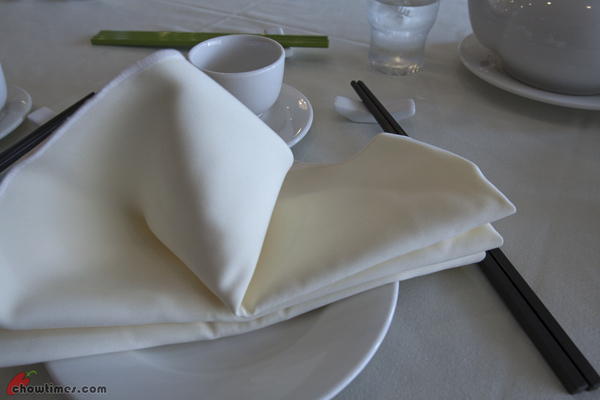 They have proper table cloth and cloth napkins with communal chopsticks already set on the table. And when I saw the menu … oh wow … they do serious Cantonese cuisine dishes here. I did not take pictures of their menu but I can tell you that the cheaper average dishes ranges from $16-$20. Even the Yong Chow Fried Rice is $16 where you could get this for $8 in some HK Style Cafe. 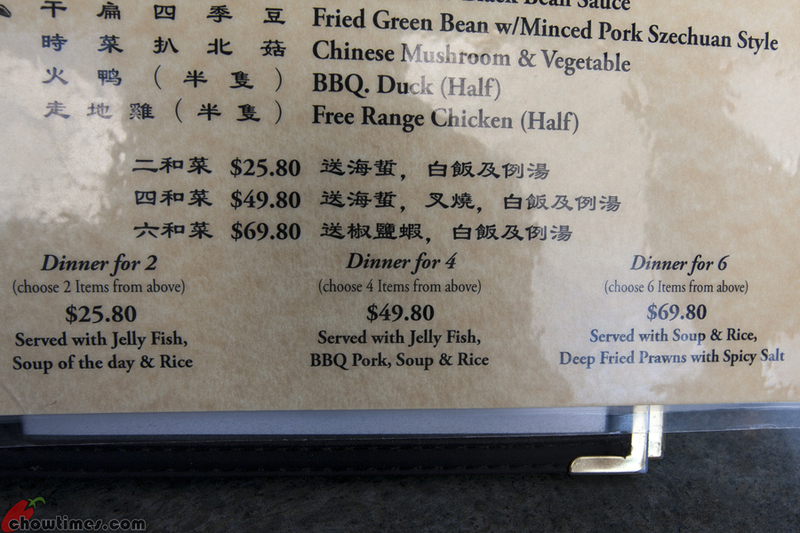 They also have a section on their menu for sharkfin at $60 a person. Their most expensive dish is the Stir Fry Sharkfin with Crab Meat and Scrambled Egg which is $76. Oh … we would have ordered that if not for the fact our boys hate scrambled eggs for dinner. LOL! Just kidding … but $76 for scrambled eggs? Yeah, they also have a wine menu. 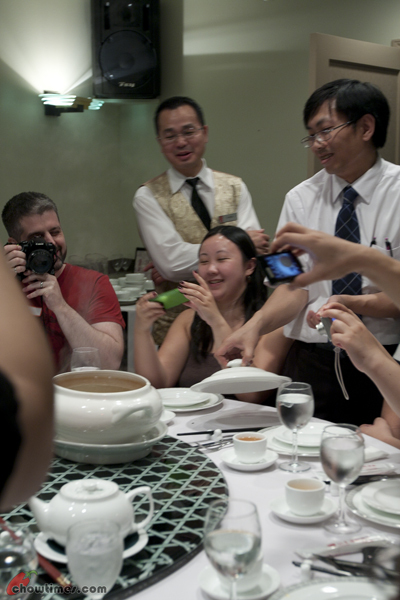 Here is one more thing … when we ordered the dishes, we asked for four bowls of rice. The server told us that she will only take the order of rice AFTER the dishes were served. That’s how it is in expensive restaurants, isn’t it? Rich people who dine in these sort of restaurants shun rice … and even if they order rice, they will take a couple of mouthful. 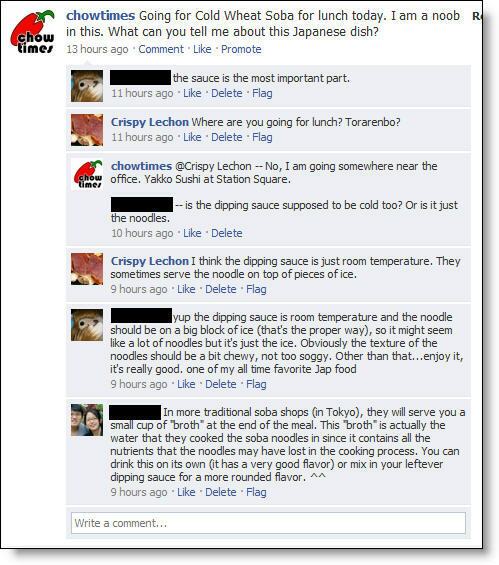 Sigh … we are not at that level of sophistication yet … WE WANT RICE … NOW! I don’t watch a lot of TV at home. Suanne does. Half of the time, our TV is tuned to the Food Network which I don’t think is a surprise to you all. Recently we came across this episode from Anthony Bourdain about Cold Wheat Soba. I found that rather fascinating because I had never paid any attention to it until now. This is because the Chinese shun cold noodles. They are almost always served hot — the hotter the better. There might be some Chinese noodles that are served cold but I can’t think of any. Can you think of any? So I tweeted a question asking if anyone knows where I could try the Cold Wheat Soba near my place of work. I know that Torarenbo in Richmond has that but I wanted to try it during the work week. Hey – hey! There are people who actually reads my tweets. I decided to go check out the Cold Wheat Soba at the Yakko Sushi today and not the Sushi Garden since I had already blogged about that place before. Hey – hey! 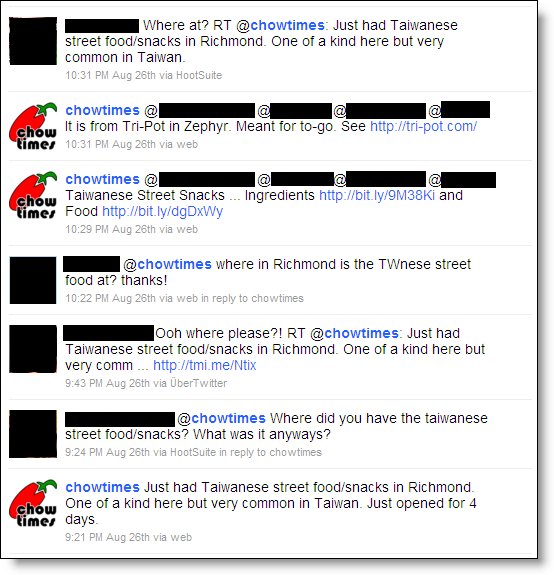 There are people actually reading the chowtimes updates. I felt I know quite a lot already what to expect even before I go. It was a short walk from the office to Yakko Sushi. OK, this is kind of confusing. 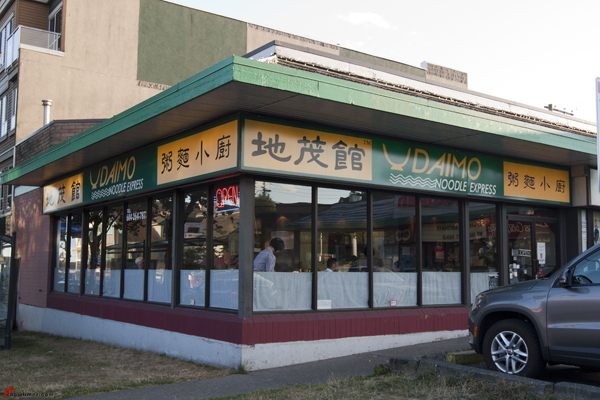 There are actually two Yakko Sushis around the Metrotown area. There is the one called the Yakko Sushi Express on Kingsway which I had blogged about here. 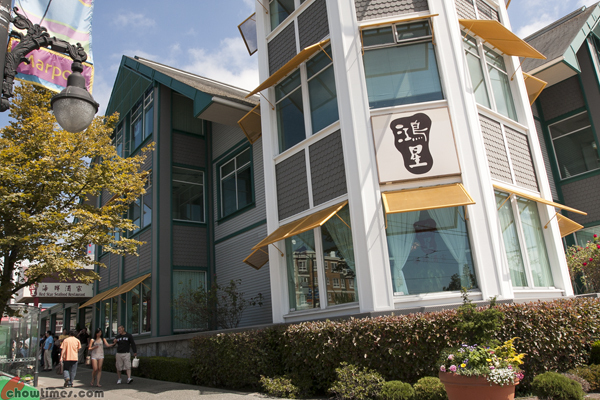 The Yakko Sushi Express restaurant is the bigger one. The one I went to today is the smaller restaurant and is just called Yakko Sushi. I am not sure if these two restaurants are related in anyway. 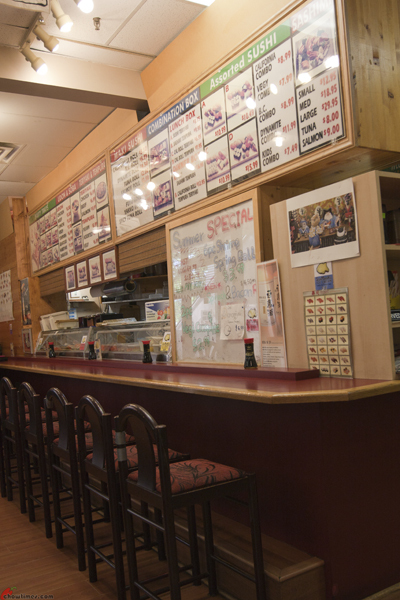 Yakko Sushi is located on Station Square. Here is a little trivia for you. 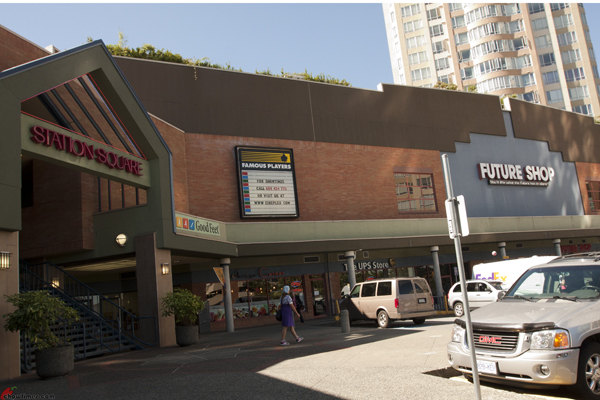 Did you know that the Future Shop in the Station Square is the highest grossing per square feet of space? I know because I worked at Best Buy and Future Shop before. Remember in those old days where Future Shop has this big wall of tube TVs in their store … you know, the days before flat screens became mainstream? Well, yours truly was the project manager who managed the whole refitting of FS/BBY stores in a project which is described as “the next big thing since color TVs”. One of the biggest logistical challenge was the tearing down of the TV Wall. It was about 6 years ago when I started on the project and it was big because the company knows that most homes in Canada will be changing their tube TVs to flat screens over a short period of a few years. In those tube TV days, a TV would cost just $300-$400 … LCDs today is easily 2-3 times that. Sorry … I digressed. I thought I heard the staff speaking in Korean in the kitchen. 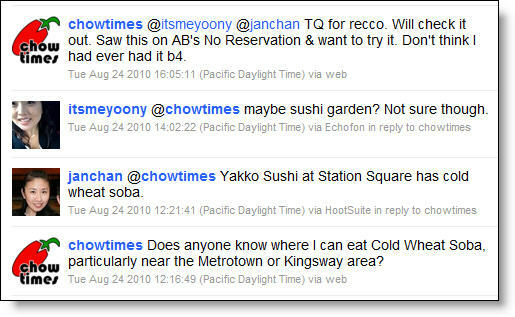 I know that the bigger Yakko Sushi Express on Kingsway are operated by Koreans too. So maybe they are owned and operated by the same people. Service was good. There is just one waitress but since this place is so small, it’s not a problem. There are only seatings here for 20 people. Since Yakko Sushi is tucked inside Station Square, I don’t think many people eat here except for people who work around this area. The menu was nothing really exciting. It is just the normal sushi restaurant menu. I am only here for the Cold Wheat Soba. You have to tell me more about Daimo. It seems like Daimo has been around for a long time. It is definitely BCT (Before Chow Times, TM). I guess they have their roots in Hong Kong. As much I try to Google them, I can’t find any references of them in Hong Kong. I got a bunch of links of the restaurant in California though. So last weekend, we went to Daimo. We had been here before just that we had never blogged about them. I am not sure why. It must have been a few years ago during the early days of Chow Times. In those days, we were timid bloggers. Today we are bold. LOL! I think we got intimidated for one reason or another. I think so. I had never paid much attention to Daimo after that visit. My earlier impression was that it was a Chinese restaurant with a Japanese name. Daimo … Daimyo. Sounds alike. Despite its age, the restaurant does not show its age. 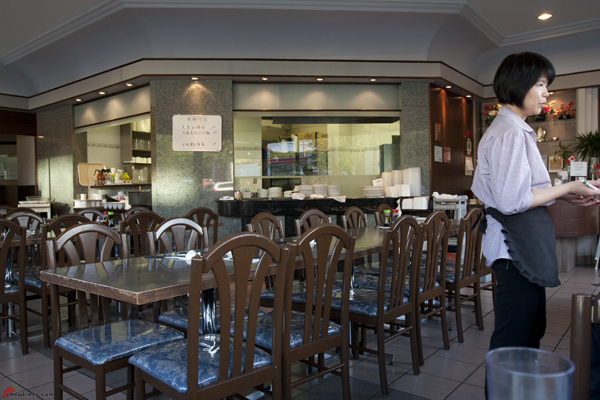 It is a well maintained restaurant. I was half expecting this place to have a little bit of peeling paint and or worn out chairs. He he he … of all things I noticed, I thought the glass were really shiny and clean. Just goes to show how they know how to take care of the image of the restaurant. Shows that they still care. The inside is kind of small. OK, we counted the seats for you. They have 42 seats. 🙂 Not too big, huh? It is kind of hard to believe that they are a branch from a successful chain in Hong Kong. I am not sure if it’s still owned by the same restaurant anymore or the ownership had transferred since. I don’t know … and am hoping some of you knows. Service is very good — very polite and very genuine. There wasn’t a lot of people (just four tables, including ours) and between the two waitresses, getting their attention is not a problem. I guess only a chain restaurant would have logo plates. Normally a small 42 seater restaurant would not bother with logo’ing the plates. 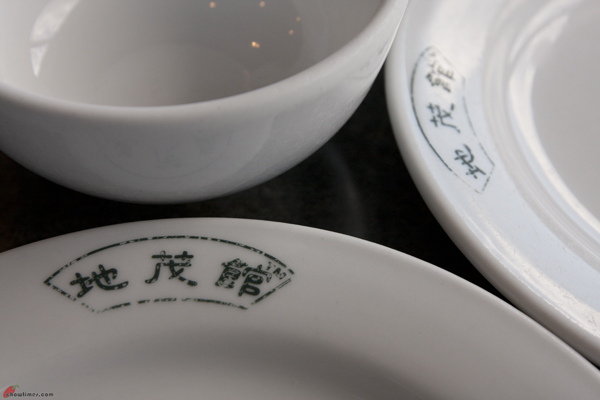 Chinese restaurants are not big in branding, generally speaking. But I guess you also see that the logos are beginning to wear off already. Their full menu was nothing too exciting. It is the usual Cantonese restaurant items. You know, like Noodle Soup, Mixed Noodles, Congee and such. You know our boys. They wanted to have their own dish (fried rice, what else?). They don’t like sharing dishes. Mum on the other hand wants sharing. And the boys know that dad is an expert in picking dishes they like. And yet they insisted on having their own serving. Well, dad has the final say. I said we will order sharing dishes, like it or not … and no more debates. As a compromise, each of us get to choose one dish … except NO FRIED RICE! This was because I wanted to choose dishes from the Dinner Combo menu (click above to show in larger image). 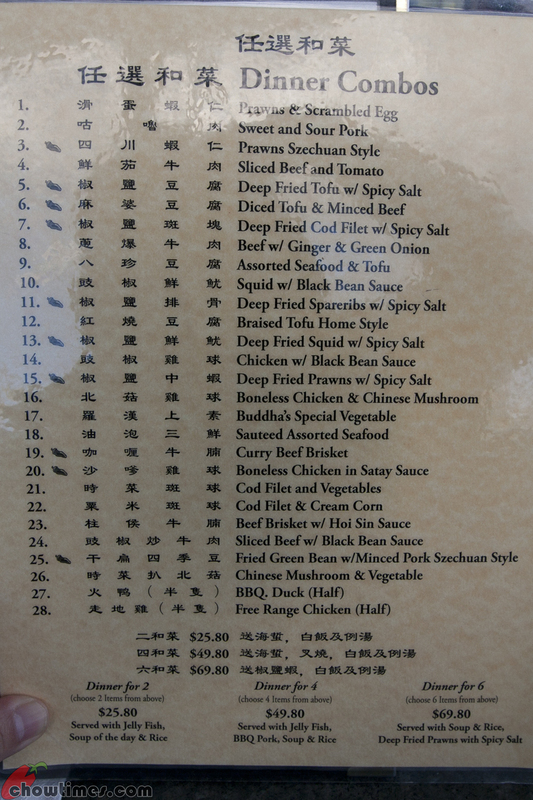 There are 28 dishes to choose from. The combo sounds like a great deal … and it was. We opted for the Dinner for 4 option. 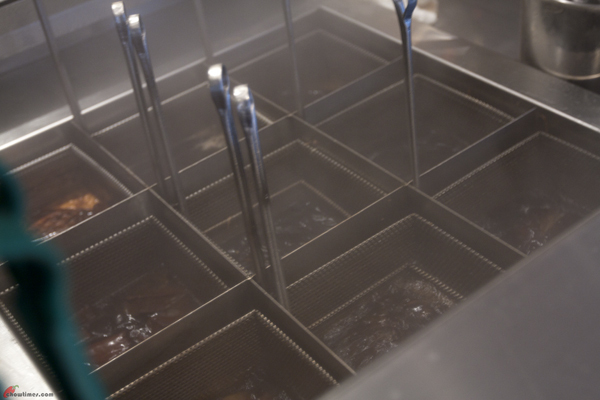 Listen to this … not only do we get to choose 4 dishes, we also get free (1) jelly fish, (2) BBQ pork, and (3) Soup! It is like having SEVEN dishes. All for $50. We knew it will be too much food. For the four of us, we normally would order three dishes. But it is either this or the Dinner for 2 option. The free soup is the Pork and Lotus Root soup. It was great and tasted really good. It surprisingly has a really deep flavour to it. Just look at the color of the soup too. Normally free soup are just so-so. Even Nanzaro and Arkensen liked it. See? Dad’s choices are not bad. If only they just give me a bit more credit. The third dinner in the Eight Great Tradition of Chinese Cuisine (8GTCC) dinners was the Cantonese cuisine. It was supposed to be the easiest of all dinners but as it turned out, it quickly became the hardest to organize. All thanks to the hard work and perseverance from LotusRapper and Joe, they managed to pull off the most fun, educational and enjoyable dinner so far. 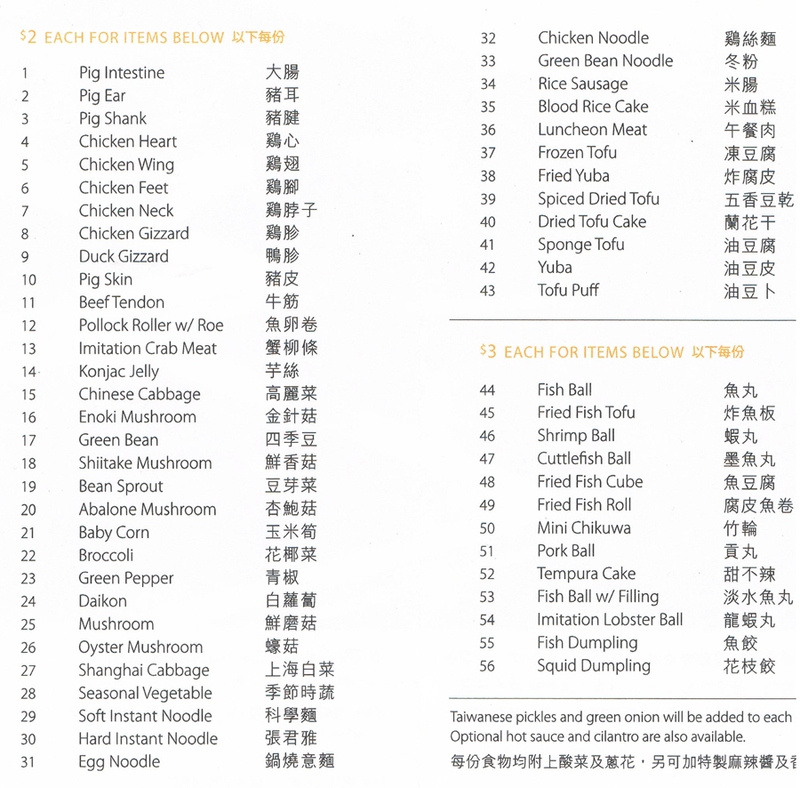 One of the problems with organizing a Cantonese dinner is simply bewildering choices. It would have been easier like the Hunan or the Jiangsu cuisine where there are just a handful of restaurants we could plan with. Not with Cantonese. 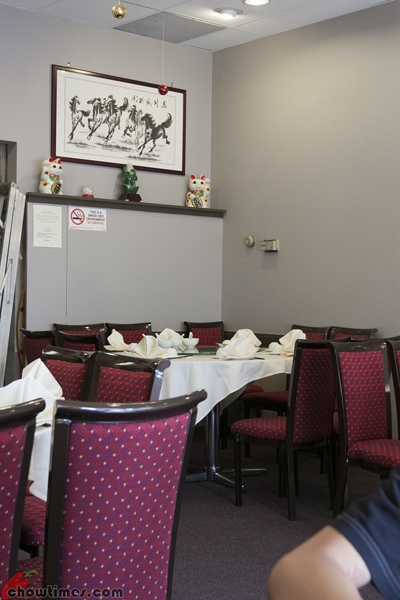 There are dozens of very good Cantonese restaurants in Metro Vancouver. The initial shortlist of restaurants that LotusRapper and Joe came up with was SEVEN restaurants … ranging from homestyle restaurants to the more extravagant ones. It took them a whole two months with countless visits to restaurants before we finally decided on what we want to do. We decided that it is only right that we host a more lavish one … in line with the reputation of the Cantonese cuisine as the most extravagant of the eight Chinese cuisine. 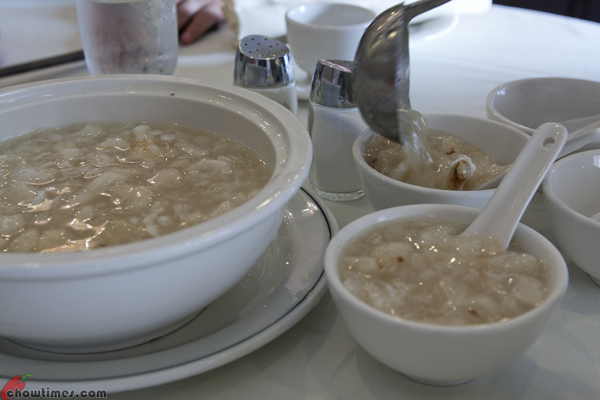 It is Cantonese cuisine that is well known for excesses like the shark fin soup, bird nest soup, abalone, king crabs, scallops and geoducks. They are the master of cooking the Alaskan King Crab and dishes that costs into the hundreds of dollars. We knew that if the cost of the dinner is too high, it would mean a lower response than the 70 people who attended the Jiangsu cuisine. After long considerations, we decided to pull the trigger and commit ourselves to the plan. In all 26 people attended the dinner at the Red Star Seafood restaurant on Granville. 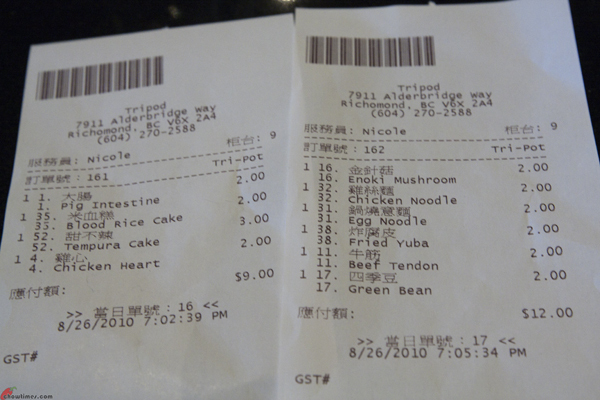 It was a 10-course dinner which costs $62 per person (including tips and taxes). The restaurant pull all stops to make sure we had a good time. We were given an entire private dining room to ourselves which was great because we could interact in ways not possible if we were in the general dining hall. Moreover, the restaurant assigned their manager and top waiter FULL-TIME to our party. That made a lot of difference. Each dish serving was accompanied by witty and educational quips. Time flew. We did not realize that it took us just slightly over 3 hours to complete the 10 courses! The pace of the dinner was excellent. One dish is brought out one at a time with a proper introduction and follow-on discussions too. Dish #1 was the Roast Suckling Pig. We asked the restaurant to bring the entire pig to show us before they take it back to the kitchen to chop it up. It was quite a sight and of course, this drew out a lot of cameras. Red Star roast the pig in house on the day of the dinner. Each pig costs $280. 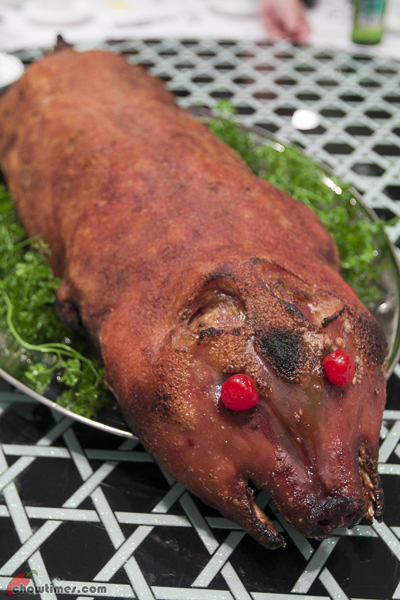 The suckling pig is served to be eaten two ways. The first way is with the crispy skin wrapped with scallions in pancakes. The thing is they have only enough scallions and pancakes where everyone has only two mouthful. The sauce above is made in house and is meant for the suckling pig. 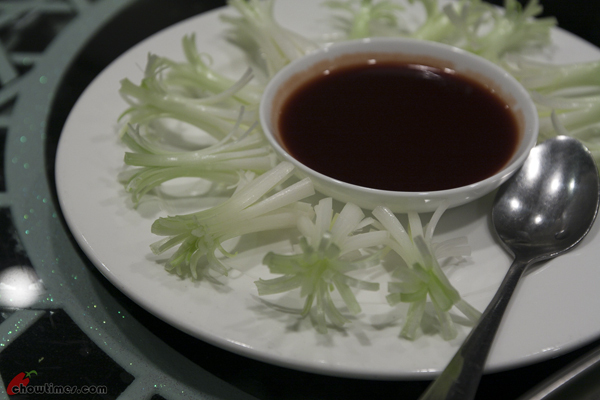 It is a mix of hoison sauce, garlic and red fermented bean curd. The suckling pig was meant to feed 20 people but since we had 26 people, everyone had a little lesser than what we intended. Dish #2 is called the Fuzzy Melon Stuffed with Fresh Scallop with a Light Sauce. Each piece of this costs $6.50 and so we only get one each. Someone was commenting that it will be more tasty if dried scallop is used. But then, of course, it would be more expensive. Question: Why is dried scallop tastier, more desirable and expensive? Is it because it has concentrated flavour and shrinkage when dried?